Falwell: Christians Need To Stop Electing Nice Guys - Joe.My.God. 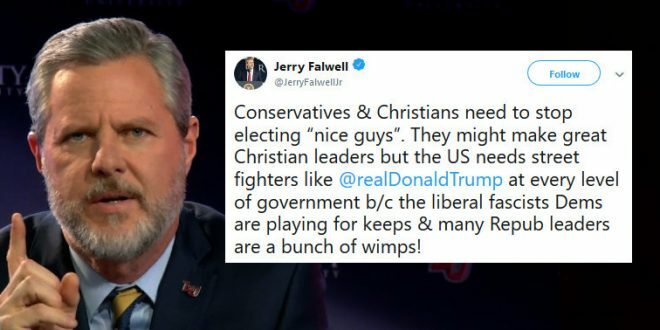 Liberty University President Jerry Falwell Jr. implored conservatives and Christians to support “street fighters” over “nice guys” in order to defeat the Democratic Party’s agenda. Falwell, a staunch supporter of President Trump, referred to current Republican lawmakers as a “bunch of wimps” in a tweet Friday night. The tweet comes as Senate Republicans have given into the demands of their Democratic colleagues for an FBI investigation into the sexual assault allegations against Supreme Court nominee Brett Kavanaugh.